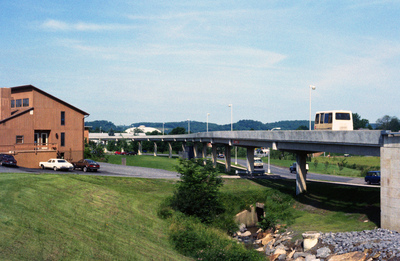 This picture shows a side view of the railway tracks for the Morgantown Personal Rapid Transit system. The entire system has a length of approximately 8.2 miles, along which 5 different stations can be found. Smolski, Chet, "Morgantown: Personal Rapid Transit System" (1981). Smolski Images. 589.